The Burlington Call Board @ Off Center, first introduced on Facebook, is a free avenue of communication between theater professionals, mostly in the Burlington, Vermont area, but all are welcome. To get the best use from this site, those posting about auditions, jobs, classes, and needs (such as set pieces, costumes, lighting, etc. ), click on the "Forum" title "Upcoming Auditions, Jobs, Classes, and Needs," then click "Start a Topic" at the top of the section (this 'topic' will be your personal entry), and enter your information. If you are a theatre person seeking current or future work, please follow these same steps in one of the other categories ('Forums'), and enter your name, contact info, bio, and upload a headshot and resume (only images can be uploaded, so if you have a resume in PDF format, open it in Adobe Acrobat and just "Save as">>"Image">>"JPEG"), or whatever combination you'd like. 1. Click "Sign up" (through Facebook, Twitter, etc.). 2. Log in through the social net or web site. 3. 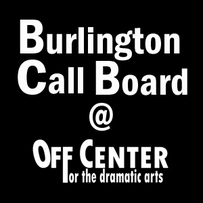 Return to the Call Board page. 4. Click "Leave message" under the automated request to join (this may take a moment to appear). Once you are approved (necessary to avoid spammers), sign in, enter the appropriate forum, and enjoy!